The story revolves around two individuals living in a apartment complex that is about to be demolished. Dawang lives with his bedridden mother and a pig he is trying to raise despite his lack of funds. His neighbor A-mao, is a show girl with pink hair who sees her career ending as she becomes older, and younger, sexier girls taking her place. Meanwhile, it has not rained in Taipei for ages. As the two of them have nowhere to go, hopelessness begins to take them over. At the last minute, though, hope appears once more. All the while, Dawang recalls the Buddhist fable of a benevolent king sacrificed himself to end his city’s drought. Chen and Yun direct a film that focuses on the modern/new taking over all aspect of life, leaving no space for the old. The building that is about to be torn down, the two protagonists, even the pig represent the old, dreams that were never fulfilled and a life that seems to be demolished for the sake of progress, of the new. The pig also seems to be a metaphor for the king who sacrificed himself, with its realistic butchering being one of the most powerful scenes in the movie. A-mao seems the most desperate of the two, since she has no plans to leave, and the fact that she is about to be laid off has led her to despair, asking her manager to marry her and trying to seduce Dawang, only to fail both times, in her quest to feel wanted again. Dawang is not much better though, since, although he has decided to leave, he has nowhere to go. Despite the permeating hopelessness though, the two directors decided to close the film with a hopeful message, showing that all is not lost yet, even for the “misfits”. Ching-Yao Liao’s impressive cinematography captures the motleyness of Taipei in the most impressive colors, as the film also functions as a tour guide of the poor areas. 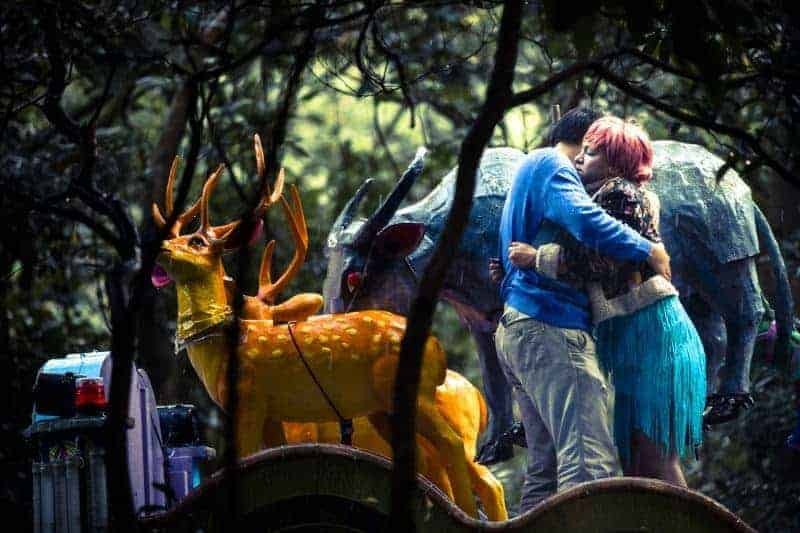 Xiao Dong Chen’s editing retains a relatively fast pace, while the combination of the two is the main source of the eeriness that permeates the film. Dawang Yingfan Huang as Dawang portrays the loser convincingly as is the case with Jung-Kao Ku as the washed up A-mao. “The Pig” is one of the most impressive shorts I have seen, through an impressive combination of beauty and meaningfulness.